One of the fun things about the Mai Tai is that the generally accepted modern recipe calls for two, or sometimes three, different rums. You get to be your own rum blender, and with even a very modest rum shelf, there are endless flavor possibilities—and, hey, they’re all likely to be good. 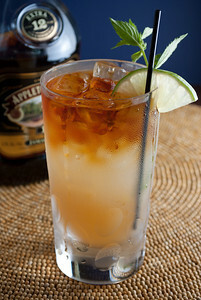 Of course, you don’t really need two rums to make a Mai Tai. Trader Vic Bergeron’s original version had only one, the famous (and famously unobtainable) J. Wray and Nephew 17 year old Jamaican. The two-rum version came about when the J. Wray 17 ran out. Instead of simply substituting another Jamaican, Vic apparently set out to approximate the flavor profile of the original; the result was a formula that called for half dark Jamaican and half Martinican. The two-rum approach would have come to him naturally, I would think, considering the multi-rum tinkering so common in the Tiki environment at the time; in fact, it’s intriguing that the original was only a single-rum formula. Anyway, it seems the two-rum approach is the current fashion among those who want to stay close to the main line of the Mai Tai heritage. The trick, of course, is to find the ideal blend of rums to suit your tastes. That experiment is a fine amusement all by itself, and should keep you busy for awhile. Many bloggers have shared their comparisons, notably Matt Robold at Rumdood. And if two rums aren’t enough, Robert Hess (video) suggests adding a third as a float. Based on Robold’s experiments, I tried his Appleton Estate 12 and Clément VSOP combination, and it makes a fine Mai Tai—and I can afford it, which is always a blessing. Thank you for all your hard work, Matt. The Mai Tai leaves lots of room for experimentation. 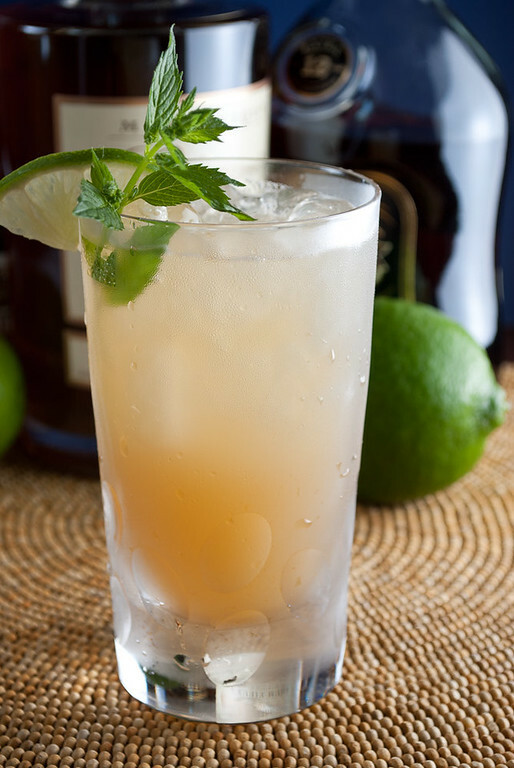 Another good and somewhat sweeter and lighter-flavored version is Lemon Hart Demerara rum combined with 10 Cane; for that matter, the straight Lemon Hart makes a very pleasant Mai Tai, too. Recipes generally just call for generic curaçao; I have had very good luck with Grand Marnier and Clement Creole. Oh, and one other delightful thing about the Mai Tai: you don’t have to put it in a goofy tiki cup, a good crystal highball will do very nicely. “The Mai Tai” at cold-glass.com : All text and photos Copyright © 2010 Douglas M. Ford. All rights reserved.